“Who would believe what we have heard” (Isaiah 53:1)? We might say that in some way this Friday which we call Good is about the voice of Jesus the Christ. Indeed, when the Lord Jesus identified himself to those who confronted him weapons and torches, “they turned away and fell to the ground” (John 18:6). With no other weapon than his own solitary voice uttering the words ‘I am,’ he knocked down, repelled and rendered helpless that great crowd, even with all the ferocious hatred and terror of arms… And now even at the present time Christ is still saying through the Gospel, ‘I am.’ And … the result is the same, as people go backward and fall to the ground because they have abandoned what is heavenly in favor of what is earthly. Those soldiers and officers fell back because “God lay hid in that human flesh…” They heard the voice of God and learned that “the voice of the Lord is powerful,” that “the voice of the Lord is full of majesty” (Psalm 29:4). So it was that they fell back in fear before him in fear. We might also say that they fell back, they drew back, they retreated, because they did not want to conform themselves to “the Word made flesh,” to the one who is himself the truth (cf. John 1:14; cf. John 14:6). The Lord Jesus repeatedly spoke the truth to them and invited them to enter into the embrace of his love time and again, but they would not allow their hearts to be changed; they refused to repent and believe in the Gospel and so backed away from them (cf. Mark 1:15). Because he desired them to open their ears to his words, he spoke “openly to the world” and often said, “He who has ears to hear, let him hear” (John 18:20; Matthew 11:15). They would not hear, but he did not stop speaking to them; rather, he continually offered the gift of his merciful love to them in order that they might allow his words to take root in their hearts. This is why the Lord Jesus commanded Peter to “put your sword back into its scabbard” (John 18:11). Not only was Peter’s act of defense contrary to the will of the Father, it also removed an opportunity for the slave of the high priest to hear anew the Word made flesh. When the Lord restored Malchus to health by giving him back his ear, he signified “the renewed hearing that has been pruned of its oldness, that it may henceforth be in the newness of the spirit…” What oldness needs to be pruned from us that our hearing might be renewed? Will we allow the strength of the Lord’s words to prune us, or will we, with the soldiers and the officers, draw back from him and refuse to hear the truth? Will we allow the solitary weapon of his voice to pierce our hearts? Let us this day not fall back from the voice of Christ Jesus to return to what is earthly, but let us instead fall down before the Cross of our Lord in humble love and ask him to strengthen our desire for the things of heaven. Let us, hearing his voice of power, of truth, and of love, believe. Amen. Saint Augustine of Hippo, Tractates on the Gospel of John, 112.3. 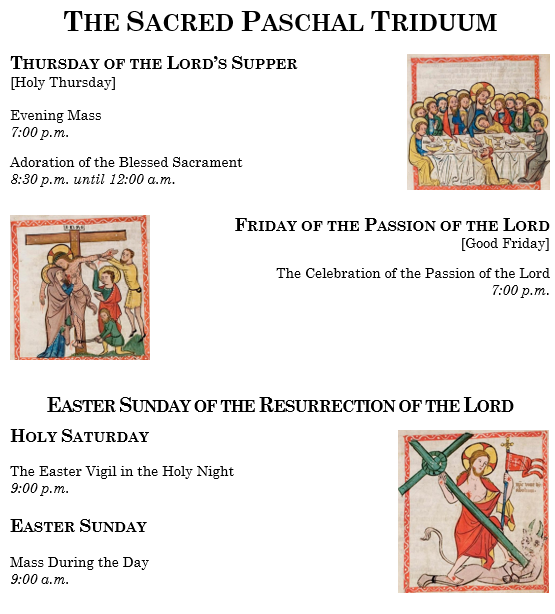 If you have not yet made plans to participate in the Sacred Triduum of the Lord Jesus Christ, please know that you are welcome join us at St. Augustine's in Ashland. The character of the Apostle Saint Peter is an intriguing one. He is a man who both loves Jesus deeply and one who repeatedly resists his will. We see this today as we reflect on the Passion of the Lord. It is Saint Peter’s loving devotion to Jesus that draws him to that fire in the courtyard of the high priest, while the others, except for John, had fled. And it is his repeated resistance to the will of the Lord that keeps him at the fire. Is our love for Jesus strong enough to bring us to the fire? Is our resistance to his will stubborn enough to keep as at the fire? Peter cannot bring himself even to mention the name of Jesus: ‘I do not know this man about whom you are talking.’ His denial has progressed from evasion (cf. Mark 14:68) to outright repudiation (cf. Mark 14:70) to perjury (cf. Mark 14:71). But there is an ironic truth in his denial: he does not yet truly know Jesus. In this, Saint Peter is a man very much like many of us. As we enter this most holy of weeks, do we truly know Jesus? How often do we evade answering questions or about speaking about Jesus? to meditate on [Jesus’] passion [and] begin to be illumined by the fire of divine love that radiates from the heart of Jesus through every moment of his sufferings, to begin to experience that in his passion he loved me and gave himself for me (Gal 2:20). The closer we draw near to this fire of divine love, the more we can understand and experience the mercy of Christ. The more we allow his heart to warm our own, the more we will desire to become like him and warm the colder areas of our own lives. We find another curious aspect in that alabaster jar from which the woman anointed the feet of Jesus. The Greek word that our translation gives as “broke” literally means “shattered;” “the woman gives up any possibility of reusing the flask or saving some of its contents” (Mark 14:3). Her action was more than a physical one; it carried a deeper meaning with it. She withheld nothing from the Lord Jesus and placed her very being at his service; may we, too, not be afraid of being known by Jesus and shatter the jars of our stubbornness, pride, and self-absorption at his feet. Let us place ourselves fully in his service and so be transformed and renewed by the power of his love. Amen. Mary Healy, Catholic Commentary on Sacred Scriptures: The Gospel of Mark (Grand Rapids, Michigan: Baker Academic, 2008), 303. Nearly a year before he transferred from the Gem City to the Windy City, the Servant of God Father Augustus Tolton told the St. Joseph's Advocate, "All were my friends [at the Propaganda College], they all loved me, though I cannot say why" (January 1888). One year later, after having moved to Chicago, he remarked to the Atlanta Constitution, "I encountered no prejudice whatever and after my ordination celebrated mass for four weeks in St. Augustine's, Rome, where princes and potentates worship (7 January 1889). This, of course, is wonderful news and shows the Cause of Father Tolton continues to move forward and, by Roman standards, quickly so, for which we should render much thanks to God! 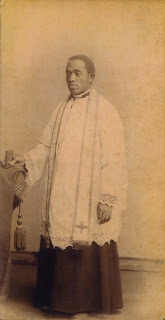 In canonical terms, a positio is something like a position paper which argues, in this case, that Father Tolton lived both the cardinal virtues - justice, prudence, temperance, and fortitude - and the theological virtues - faith, hope, and love - to a heroic degree and so is worthy of receiving the honorific, title of "Venerable." Let us pray the positio now quickly makes its way into the hands of His Holiness Pope Francis and that he finds time to read it soon. May the Holy Father also agree with its findings so our beloved Father Gus may soon be raised to the dignity of the altars! We are, as it in were, in the midst of a slow liturgical death. On Ash Wednesday, the great song of Alleluia fell silent. Yesterday, the images of the Cross of the Lord and his saints were veiled to keep us more focused on the task at hand through a fasting even of the eyes. On Holy Thursday, the bells will fall silent, the altar will be stripped, and the holy water will be removed from the fonts. On Good Friday, even the Holy Mass is taken away. But then, suddenly, on Holy Saturday night, everything returns with what Saint Augustine called “the mother of all holy vigils,” the great Easter Vigil. It is a slow, methodical, and intentional liturgical death, a dying culminating in the Resurrection of the Lord. Each of these little deaths, each of these small sufferings which Mother Church offers to us, are a means of expressing something of what Jesus means when he says, “unless a grain of wheat falls to the ground and dies, it remains just a grain of wheat; but if it dies, it produces much fruit” (John 12:24). This is a passage very dear to my heart, one I first discovered on my first Great River Teens Encounter Christ retreat more than twenty years ago, and one that will be proclaimed at my funeral. With this common and everyday analogy, Jesus reveals the mystery of his own life and the mystery of the Christian faith. Just as the grain of wheat must surrender and die in order to break through the shell and the soil to reach the sunlight, so, too, do we die to our liturgical senses to focus more on the heart of Christ and so be perfected. In much the same way, whenever we suffer, there is a certain dying that takes place as we come to accept the reality that we, with our will and desires, are not in control of our lives. There is a greater will than ours governing our lives to which we are called to obey, for the Lord says to us, “Whoever serves me must follow me, and where I am, there also will my servant be” (John 12:26). This is why Saint Peter encourages us, saying, “Beloved, do not be surprised at the fiery ordeal which comes upon you to prove you, as though something strange were happening to you. But rejoice in so far as you share Christ’s sufferings, that you may also rejoice and be glad when his glory is revealed” (I Peter 4:12-13). like a grain of wheat that God the Father has sown in the world. Indeed, only in this way can a new humanity germinate and grow, free from the dominion of sin and able to live in brotherhood, as sons and daughters of the one Father who is in Heaven. Are we willing to accept the pain that comes with this growth? Are we willing to die to ourselves to allow the new growth, the new and full humanity, Christ yearns for us to have? Letting oneself be permeated by the forces of the earth and from on high. Letting oneself be changed in them, letting oneself be decisively transformed by what comes to us as a challenge: by God’s trials, by his gifts, by yearning, by the good things and the difficult things that people give us to bear. And growing, becoming new in this maturation process. This is the task and the challenge of the Christian life, especially in these final days of Lent and the deliberate removal of various aspects of the liturgy can help us take up again the spiritual weapons of prayer, fasting, and almsgiving to endure and triumph with Christ over the many trials that come to us. He calls each of us to become like that grain and die to our selfish ambitions, desires, and sin in order to produce much fruit, both in our lives and in the lives of others. He calls us to unite our sufferings with his own for the salvation of the world. This is what we call redemptive suffering, a suffering that benefits others, a suffering that is not suffered in vain. This is what gives suffering its beauty, its power, and its grace. Like the grain of wheat, each of us must struggle to overcome our selfishness and live for Christ in order to bear his fruit in our lives, the fruits of “love, joy, peace, patience, kindness, goodness, faithfulness, gentleness, [and] self-control” (Galatians 5:22-23). Those who produce these fruits will be with Jesus because they will have become like him. If we desire to be with the Lord we must follow him; and whoever follows him must be his servant, so that we might be called, in the end, his friends (cf. John15:15). Therefore, whoever wishes to be with Jesus must follow him to the Cross. In a word, a Christian must be willing to suffer. This is, in effect, the response Jesus gives to those who said to Philip, “Sir, we wish to see Jesus” (John 12:21). Is this not the yearning of every heart, to see Jesus, to see him who is the fulfillment of our every desire? The Lord knows this, for he has placed it within our hearts. When the voice of the Father was heard confirming all that Jesus had said, some in the crowd thought it only thunder. Why? They did not hear the truth because they remained in the crowd, outside the circle of Jesus’ friends; they were near him, but they were not close to him; they refused to enter into the mystery of Jesus Christ. The same is true with us. If we wish to remain merely as bystanders to the suffering of Jesus and to his Cross, we will not see his glory. But if we enter into his suffering, if we embrace his Cross in our lives, then we will see him and recognize his glory. In these coming days, then, may we, like humble grains of wheat, so allow ourselves to be transformed by God’s challenges and gifts as to mature in faith, in hope, and in love. May we seek to become obedient to the Cross as it comes to us and so be perfected in the glory of Christ. And, having been perfected, may we see him face to Face. Amen. Saint Augustine of Hippo, Sermon 219. Pope Benedict XVI, Angelus Address, 29 March 2009. Joseph Ratzinger/Benedict XVI, Teaching and Learning the Love of God: Being a Priest Today. Michael J. Miller, trans. (San Francisco: Ignatius Press, 2017), 52. As we approached the altar of the Lord this morning, we implored him for the grace of “prompt devotion and eager faith” (Collect). Just two Sundays ago, we considered what it means to be devoted, how being devoted means to be dedicated by a vow, to have sacrificed oneself, and to have made a promise in a solemn manner. How often are we prompt in our devotion to the Lord? How prompt are we to keep the vows made at our baptisms and to hold fast to the promise we received? How prompt are we to make a sacrifice of ourselves to God each day? It sometimes happens that, by a sudden inspiration of the Holy Spirit, the notion pops into our head that we should pray the rosary, that we should pick up our Bible, or even that we should make a visit to Jesus in the Blessed Sacrament. After recognizing the goodness of this thought, we frequently decide there are more pressing matters requiring our attention and put off this holy inspiration. Sometimes we return to it, but more often we forget about it. At other times in our conversations with others, we realize we should say something about the goodness of the Lord and his action in our lives, but we become concerned about offending someone and remain silent. If we are honest with ourselves and with the Lord, we are not always very prompt in our devotion or eager in our faith. We see something of this in the reading from the Second Book of Chronicles in which the Israelites “added infidelity to infidelity, practicing all the abominations of the nations and polluting the Lord’s Temple which he had consecrated in Jerusalem” (II Chronicles 36:14). The Lord was with his people, but his people was not with the Lord. In response to their repeated infidelities brought on by their lack of devotion, the Lord allowed them to fall under the power of the Babylonian Empire to shake them back to their senses. When their homes were destroyed and their possessions taken as spoils or war, they, too, were carted off to Babylon where they sat by the streams and wept, remembering Jerusalem and the Temple of the Lord that their conquerors destroyed (cf. Psalm 137:1). In their grief, they cried out, “May my tongue cleave to my palate if I remember you not, if I place not Jerusalem ahead of my joy” (Psalm 137:6). The Lord allowed them to remain under the Babylonian Captivity until they again grew eager in their faith and renewed their devotion to God. When they sang of placing Jerusalem ahead of their joy, what did they mean? Jerusalem was more than the capital city. Jerusalem was home to the Temple, to God’s dwelling among men. Jerusalem was, therefore, the location of contact with God, where praise was given to God, where sacrifices were made and sins forgiven, where God and Israel communed together. 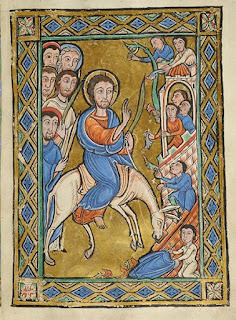 To place Jerusalem ahead of their joy meant to keep things in right order, to keep their relationship with God first and foremost in their thoughts and deeds. The Lord Jesus Christ came among us “even when we were dead in our transgressions” and “brought us to life” by his Passion, Death, and Resurrection (Ephesians 2:5). In his Incarnation, we see that even “if, at times, the flame of charity seems to die in our own hearts … this is never the case with God! 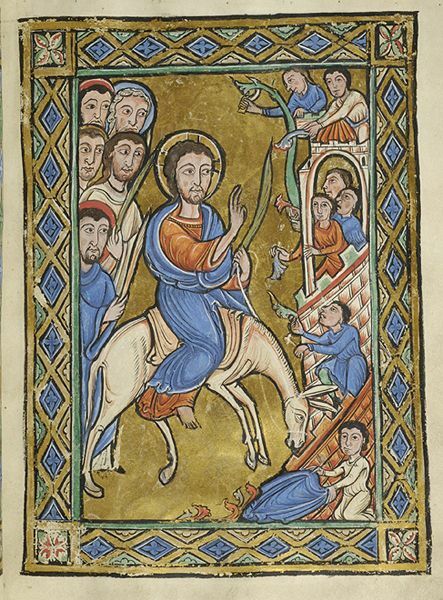 He constantly gives us a chance to begin loving anew.” Even now, he calls us to keep the Heavenly Jerusalem ahead of our own joy – to keep our relationship with God first and foremost - so that his joy might be in us and our joy might be complete (cf. John 15:11). Just as at the beginning of this Holy Mass we asked God for “prompt devotion and eager faith,” so, too, at the end of this Mass will we ask him to “sustain the weak” so we might “reach the highest good” (solemn blessing). It is impossible to reach the highest good apart from the Cross, for it was on the Cross that the highest Good – Christ Jesus - was himself lifted up “so that everyone who believes in him may have eternal life” (John 3:15). He was lifted up upon the Cross to heal us and make us whole, and it is from his Cross that his light shines forth, beckoning all who turn to toward the light. It is not hard to see that “people preferred darkness to light, because their works were [and are] evil” (John 3:19). So often we know our sin and yet we refuse to humble ourselves before the Lord to seek his mercy and receive his absolution. We hide from him, thinking somehow that if we stay in the darkness we will be at peace, but our experience proves this false. The more we hide from his light, the greater our pain becomes. It is only by stepping into his light, by seeking his forgiveness, that our hearts find peace. Pope Benedict XVI once said, “In the heart of every man, begging for love, there is a thirst for love.” Are we not all beggars for love? Saint Augustine said, “Only the lover sings.” Given that both are true, let us not leave our harps on a tree in our anguish; let us not abandon or song of love. Let us, rather, look to the Cross of our Lord Jesus Christ and see there the depth of his great love so freely given and “sing to the Lord a new song” (Psalm 96:1). Amen. Saint Augustine of Hippo, Confessions, X.27. Henry Chadwick, trans. (Oxford: Oxford University Press, 1991), 201. Pope Francis, Message for Lent 2018. Saint Augustine of Hippo, Sermon 336.